Once I was approved, the pressure was off a bit. Now I could look without going through the dreaded used car schmaltz routine. The dealership I visited let me shop unaccompanied. Good move. I hate being shadowed. Then two more private showings, both of which were in excellent shape for their age. The one couple was a real pleasure to speak with and we ended up discussing tiny homes, homesteading, canning, gardening, hunting,simplifying life, etc. They would make nice friends if it weren’t for the oddity of hanging out with a married couple. (Never mind that several of my closest friends are married, lol) But when most of them formed, I too, was married. Then my vacation time got grand baby crashed, and I had a sleepover, then a four hour car ride with two under-threes. I had quite happily forgotten what being in the car with car-seat restrained little bodies was like. It’s like pregnancy; you vaguely remember discomfort, but promptly forget it. All in all, the boys were good. They are just…well, boys. 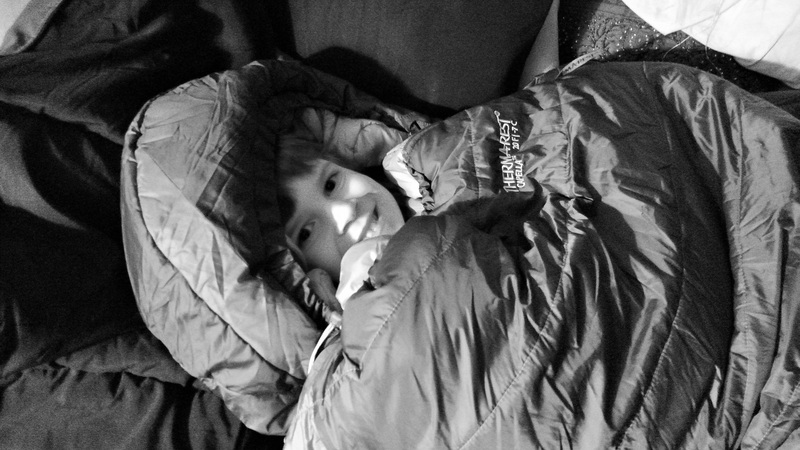 Luckily they DO love sleeping in Bubbe’s sleeping bag in the chilly apartment that lacks heat. Indoor camping! The trip to see RV sites was less fun. The one that I found that I really, really like is about 1.5 hours from work. That’s using the pricey toll road route too. I’ll tuck it away for ‘maybe’, even though the amenities of the area are stellar for hiking, biking, working out and hitting the Gulf beaches. At least at that one, I didn’t appear to be THE youngest person there. But close. So now I am in thinking mode – futzing with the spreadsheet, moving numbers around, trying to think of what I’ve not thought of in this delicate balancing act I am trying to pull off. I am supposed to be primitive camping right now. In some ways I am glad I am not. In other ways, I’m really longing to be there. The temps are really low, with lots of snow (for the area, not for say, MA or such). It would have been a good gear test, if I had known in advance and been prepared. But if I wasn’t, it could have been a close call. Since I am trying to make a moving decision, I decided to forego the camping and use my time off to look around, plus tuck that gas money saved into the new portable homesteading budget pocket. While my AT hiking gear is three season, I’m really not certain that my lightweight tent would handle the snow load. With a predicated wind chill of down to 15 below, I don’t think I’d have been tromping around taking fairy wonderland snow photos as much as I think I would. That tent would get mighty small if that was where I had to stay all day and all night. Still, it would have been a good challenge and experiment. Now I’ll have to wait until I’m on the trail to see, or maybe next year at camping time. The most limiting factor would have been the ice en route and the winter storm predicated this Friday. I don’t mind camping in the snow and cold (I’ve done that), but I am askeered to drive in that stuff! I’ve only driven in snow once or twice, and the first time was dorky but fun. It was a harmless way to showcase my ignorance. See, I didn’t know that you had to shovel a drive way when it was just a foot or so of snow. I learned that pretty quickly when my SUV simply wouldn’t move. Out I got, and stared at the little snow mountain mounded to just beneath the hood line. Hm. I also didn’t own a snow shovel, but I did have a regular shovel in the barn. Like I said, a harmless showcase of ‘stupid’ which ended just fine. And it was beautiful on the drive once out of the drive way, lol. I was probably more in danger from trying to take photographs than from any weather issue. So yeah, I wish I were there, but I’m not. The result of looking at RV’s has me now scouring the ‘net for how to detach from the emotional connection to stuff. Whereas I thought I’d be moving to something larger than the micro-haus come the time to leave, for a while I will be living in something possibly a mite smaller than where I am now, and maybe for a few years past that point as well. Eeep. I read an article by a woman who got rid of 91% of her things. That’s 9 out of 10 items you can lay your hands on. That’s one tough cookie there. I have boxes for the kids, boxes for Goodwill and trash bags sitting around. Some stuff has already left the building too. It is difficult to shift from a prepping/storing/canning prepared mindset to ‘how little can you live with?’ mindset. And of course, some discoveries made no sense at all. Seven spatulas? Seriously? Why? Granted I used to cook for much larger groups and far more often, but I’m pretty sure I’ve never used seven spatulas in one day. Three whisks. Okay, so they were small, medium and large sized, but still. We won’t even venture into coffee cups, glassware, lingerie, jewelry and perfume either. Or shoes. Definitely not talking about shoes. My task has been to go through a drawer, a cabinet or a box a day. No pressure, right? Except some of this stuff sticks to my hand when the hand moves to a box or hovers over a garbage bag. It would be funny if it weren’t so silly. Or so emotionally charged. While RV’s are designed to maximize space options, they are still only about 27-35 feet long and 8 feet wide. I actually looked at a toy hauler because that’s like a tiny house with its own storage unit! And I could tie the boys down when they get too rowdy, to those tie downs in the floor, lol! But they don’t look or feel like a house at all. That leads me back to getting rid of things so I can inhabit something that looks remotely like a house or an apartment. Indecision is humorous when it isn’t you! Hiking has taken a back seat lately to running around to look at RV’s and sorting through my household goods. I miss it. I’m going to get out there this weekend and do some of it. Trying to coordinate surgery, relocate so my kids can help me recover, find a place to live for a year after that, sort through stuff, plan an AT hike, keep up my herbalism studies, write something now and again, work a full-time job and then throw in some babysitting and parental visits, and I’m out of time. More. Time. I need it! And that dear readers, is what you get when I empty my mind at the keyboard. It might just qualify as ‘fluff’ itself! This would make a great follow up post on your journey!!!!!! My husband is talking RV! We live in a 2200 sg ft house, me fit in a RV. I recommended we rent and see National Parks and see if the idea still fits. I want a much smaller house but coffee or shower, not a trade off I think about. Have a great weekend RV shopping.